What’s an Easter feast without a deviled egg? Everyone loves deviled eggs, especially on Easter Sunday. Today, I’m sharing my recipe for ABK’s Classic Deviled Eggs! Rule #1 ( most important rule) Don’t overcook the egg. Follow the method below for perfect boiled eggs. If you have an Instant Pot, you should never boil eggs on the stove! Use your Instant Pot and follow my directions for Instant Pot Hard Boiled Eggs. 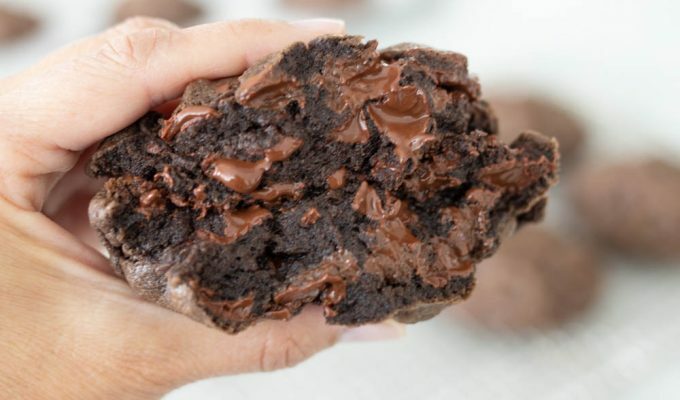 You will never go back to the stove top method! 2. Grate, instead of smash the yolks with a fork. You’ll get a smoother filling overall. 3. Don’t add too much mayo, or the filling won’t set up and the end result will be a not-so-pretty egg. 4. Fill the egg with a bag. Use a decorating tip, the same as if decorating a cake. Your eggs will look like they were filled by a professional, vs a 3 year old (which is what my eggs look like when I don’t use a tip). food photography skills. Bless his heart. Even though this recipe for ABK’s Classic Deviled Eggs looks complicated, it’s not. I added lots of tips to make it easier for you. Because I love you. And I want your deviled eggs to stand up to the scrutiny of your mother in law. One tip for the bag. That’s it. 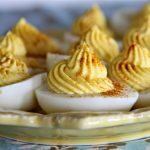 Read the recipe carefully before starting, especially the note section of the recipe, and you will be a master of deviled egg making! Carefully place the eggs in a pan large enough to hold all of the eggs. Cover with cold water about 2 inches above the eggs. Heat over medium high heat until the water boils. Boil for about 1 minute. Remove pan from heat, cover and let sit for 10-12 minutes. Rinse eggs with cold water, until eggs are cool enough to handle. Drain water, crack the eggs and remove all shells. Discard shells. Unless you are Martha, and are making a craft for a centerpiece out of egg shells. After peeling, cut the eggs in half with a sharp knife. Gently scoop out the yolk into a deep bowl. You will want a large, deep bowl so when the yolks are beaten, they don't spill over the edge of the bowl. Place the whites on a platter, or dish to transport the eggs (see below). After all of the yolks have been removed, gently grate the egg yolks against the grate on a box grater. Add 1/2 cup of mayo, 2 teaspoons mustard, salt and pepper to the yolks. On low speed, beat the yolks just until smooth. If the yolks are not creamy enough, add additional mayo a little at a time, until the mixture will adhere to a spoon, but not fall off the spoon if turned upside down. If the mixture is too runny, it will not sit up well in the egg white. Taste the filling and add more salt and pepper if necessary. Fit the end of the plastic bag with a star tip. Cut the end of the plastic bag off, so the end of the tip is exposed. Roll the end of the bag to the outside, so the inside of the bag is exposed as much as possible, making the bag easier to fill. Use a large spoon and fill the bag with the egg yolk mixture, Spooning the filling into the bottom of the bag. When finished, unroll the edges of the bag and fold the bag down and let any extra air out of the bag, so the filling is ready to be squeezed out of the bottom of the bag. Using a swirling motion, fill the eggs with the yolk mixture. Repeat until all of the filling is gone. Sometimes, I have an extra white, or two. Serve or refrigerate up to 24 hours before serving. -For easiest peeling, it is best to use eggs that are a few days old. Unless you are using the Instant Pot method (search Instant Pot hard boiled eggs on ABK) for cooking eggs, then you may use fresh! -The size of the egg will determine if you use 1/2 or 3/4 cup of mayo, or possibly a tablespoon or two more than 3/4 cup. If you are purchasing extra large Costco type eggs, the eggs (and yolks) are usually much bigger than the extra large eggs purchased at the corner grocery. -Grating the yolks, instead of smashing with a fork will give your deviled eggs a very smooth filling. I also used a beater to mix the ingredients after grating. Don't over mix, just enough to incorporate and get an even filling. -Filling options. The options are endless. I'm into simplicity. My favorite egg salad sandwich has just mayo, egg and salt. So I love this recipe. You can add hot pepper sauce, vinegar, flavored mustard, sweet relish, chopped up anything, and lots of garnishes to top the egg. Just make sure it doesn't get too wet, or it won't sit up pretty when you go to fill the whites. And be sure the filling (chunks of desired filling) will still squeeze out of your pastry bag and tip . -Where's the vinegar? Most recipes call for vinegar. I'm not a fan, so I leave it out. The mustard gives the filling a nice little bit of tart flavor, and I like the simplicity of yolk and mayo. -Do not use a serrated edge knife to cut the eggs in half, or your eggs will not have a smooth edge when filled. -White pepper is recommended, but black pepper is fine as well. -When filling, use a disposable plastic pastry bag fitted with a decorative tip. I used a large star tip. Slide the tip into the bottom of the bag before filling, then snip off the end of the plastic bag. A Ziploc bag works if you don't have or want to purchase pastry bags. Pastry bags and tips can be purchased at grocery, craft or kitchen specialty stores. I like the disposables, because they are easily tossed after using. They usually come in packages of 12. The tips are $1-2 each and may be used over and over. -When transporting the eggs, use a sheet of parchment paper or a paper towel on the bottom of a dish. It will keep your eggs from sliding around. I put mine in a 9x13 plastic ware dish and snap the lid on. See photo below. -You can make this recipe the day before serving and hold them in the fridge. Just remove from fridge and serve when ready. They will look and taste the same the day after preparing. -You've now earned one credit toward your Master Deviled Egg Chef degree. Congrats! This is awesome. I think I'll make my Dad happy and make him some for Sunday's dinner. Have you done your eggs in the IP yet? 6 minutes=perfection. The shells practically fall off. Also we sprinkle with a little chili powder. Try it. I bet you will love it. Yes! I have cooked eggs in the IP. You’re right – it’s fantastic. I’ll give the chili powder a try!